Vino Noceto Winery at Buon Appetito Here we go again! As we enter into our twenty-third year, our list of wineries is filling out nicely. Each year, we try to have some new wineries and some repeat visitors, and at least one local winery. 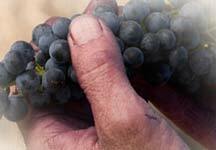 This year we start with the return of Vino Noceto of Amador county, previously featured in October 2010. Vino Noceto specializes in Sangiovese and other Italian varieties. Winemaker Rusty Folena will be our guest speaker. Buon Appetito owner and Executive Chef Martino Oviedo has come up with a great menu. 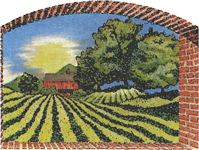 This month we are bringing you a local winery, Fenestra Winery from Livermore. When Lanny & Fran Replogle started Fenestra, there were only four other wineries in the Livermore area. Lanny has handed off the winemaking duties to Aaron Luna, and he is doing a great job. Santorini's chef, Tony Sohi has come up with a couple of new (to us) dishes, and a couple of old favorites that pair nicely with Fenestra's wines. You may be surprised at how well some of these wines pair with the food! 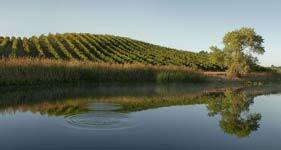 This month we are bringing you a repeat visitor winery - Scherrer Winery from the Russian River area of Sonoma County. Fred and Judi Scherrer get many of the grapes from the Russian River, but Fred's father also established the Scherrer Vineyard in Alexander Valley from whence the Chardonnay and Zinfandel we are having are from. This will be the third time we have had Scherrer Winery, and Fred as our guest speaker. Buon Appetito's Martino Oviedo has come up with fabulous menu to pair with Scherrer's fabulous wines, as you will see on the attached menu/reservation form. Artesa Winery at Buon Appetito This month we are bringing you a new winery to our chapter - Artesa Winery from the Carneros area of Napa Valley. 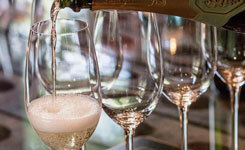 Artesa started out as the American division of the large Spanish Cava producer Codorniu. Because of their Spanish ties, we will be featuring some Spanish wines as well as their California counterparts with some courses. 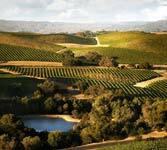 The other courses will feature "regular" and "reserve" bottlings of the wine varieties the Carneros region is widely known for: Chardonnay and Pinot Noir. Buon Appetito's Martino Oviedo has come up with an amazing menu to pair with these delicious wines. We are again taking a summer tour. This time, we are visiting the famous Napa Valley, but in an effort to avoid the over-crowded tourist traps we are going to wineries that are not on Highway 29, not on Silverado Trail and not on Highway 12, in other words "off the beaten path". Steve Arnold and Jim Lipman are coordinating this event that will take us to four wineries and we will provide box lunches. Most of the wineries provide discounts to our group. Off the beaten path or not, this is still Napa, so these wineries charge a tasting fee that may be waived if we purchase enough wine. If we do not, there may be additional fees assessed. We want to take as few vehicles as possible so that we can minimize dust in the vineyards and having to wait for stragglers. Therefore, we will have a meeting point where carpools can be assembled at the home of Gail & John Engstrom in Dublin. We may have a second meeting point, if there is sufficient interest in another locale. You can, of course, make up your own carpool of four or more, but we ask that you still meet at one of the rendezvous points to exchange cell phone numbers and the like. This event is strictly limited to no more than 20 people - first come, first included, so sign-up right away. This month we welcoming back an old winery friend of our chapter - Frog's Leap Winery from the Napa Valley. Frog's Leap grows their Sauvignon Blanc, Merlot and Cabernet Sauvignon on their Rutherford Bench property, and supplements their selection of wines from throughout the Napa Valley. Buon Appetito's Martino Oviedo has come up with a menu to pair with these delicious wines, as you will see on the attached menu/reservation form. Chalone Vineyard at Dana's Chalone Vineyard from the Chalone AVA is the oldest winery in Monterey County. 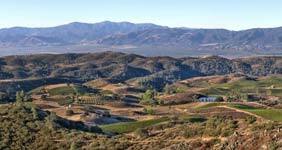 Like the Santa Lucia Highlands and Arroyo Seco AVAs on the other side of the Salinas valley, they receive cooling ocean breezes which allow Chalone to make great Pinot Noir and Chardonnay. But Chalone differs from those locales in that it sits on limestone rich soils, like found in Burgundy, which gives a minerality to all of its wines. As good as their Pinot Noir and Chardonnay are, my personal favorite varietal may be their Chenin Blanc. Bone dry from vines nearly 100 years old, this wine rivals, or even surpasses, the great old vine Vouvrays of France. Michael Garcia of Dana's, has come up with an imaginative menu to pair with these wines, highlighting their strengths and coaxing out their nuances. Please see the attached menu/reservation form for details. Please send in your reservations quickly. Dana's is a small restaurant, and the date is nigh. 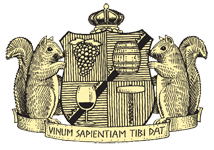 A reminder that Tasters Guild is now part of the American Wine Society. Please forgive us if it takes some time to phase in some of the new information. Your existing membership will be converted into a new membership in AWS. If your membership would expire in 2017, it will extend to the end of this year, and if it normally expires in 2018 it will extend until the end of 2018. This is so we can sync up with AWS' calendar year membership cycle. Nalle Winery at Buon Appetito Like Chalone Vineyard in October, Nalle Winery has been on my winery "wish list" for a long time. Like most small wineries, they don't have the personnel to go hither and yon to sell their wares. After all, Nalle only makes about a 1,000 cases of wine, total. Being in the heart of Dry Creek, of course they make Zinfandel, but unlike most of their neighbors it is under 14% ABV. This makes for a more elegant, and more food friendly wine. Jules Kragen, with whom I attended Baldwin Hills Elementary school over 50 years ago, will be the speaker. Martino Ovieto of Buon Appetito has re-tooled some menu items to optimize the pairings with each wines' individual flavors. Schramsberg & Davies Vineyard at Dana's Unlike Chalone Vineyard in October, and Nalle Winery in November, Schramsberg is not new to the Diablo Tasters Guild. Vice President of Marketing, Laurent Sarazin presented Schramsberg in December 2011, and was scheduled to present in December 2002, but had to have a substitute presenter on that occasion, as his daughter was being born. This year, when asked if he would like to participate again, he agreed, with the caveat that we feature the "good stuff". So, the J. Schram "tete-du-cuvees" and the Davies still wines will be prominently featured. I would like to point out that on our "field trip" to Napa in August, the wine that was purchased most by members of all the offerings on the day was the Davies Pinot Noir. Michael Garcia, Executive Chef at Dana's has come up with another winning menu, although he has yet to decide whether dessert will be an apple tart or an apple galette. Either will be delicious, though! December is also when we award our Diablo Points prizes. We will tally all the points earned this past year, and award the top three finishers a special prize wine. We will then allocate one ticket for every point earned for places 4 through ‘N’, and randomly draw numbers corresponding to specially culled bottles of wine (one per event) from the past year. Will Karen and Keith Kato repeat their 2016 success? Will Joyce and Dan Jones win for an unprecedented sixth time? Will someone new win? Be there to find out.